Speaking Doric or is it just Slang? Doric is the slang language spoken in Aberdeen by the natives who grew up here. I call it slang as that’s what it was called the whole time I grew up. It certainly wasn’t mentioned as speaking Doric. Nobody bothered to tell me that it has a fancy name and is called the “Doric” back then. All I remember are teachers and parents doing their best to stop us “spikkin” slang. The t’s tend not to often not be sounded in the middle of a word and mostly have a harsh glottal stop on them. (Buh er) instead of butter. (Waah er) for Water. It was a bit of a revelation to me to have the modern view that “intellectuals” think we need to preserve this way of speaking when I spent the first thirty years of my life being ashamed of saying the most slight Doricy pronunciation. Even now, I give my children into trouble for using slang *cough Doric. * In the last few years, I’ve learned that I had to embrace the worst of the local language that existed in the homeland and try to give it a chance as a heritage from my home, no matter how it still makes the hair stand up on the back of my neck. I’ve written Doric poems and sold a few of them too, so people must like them. 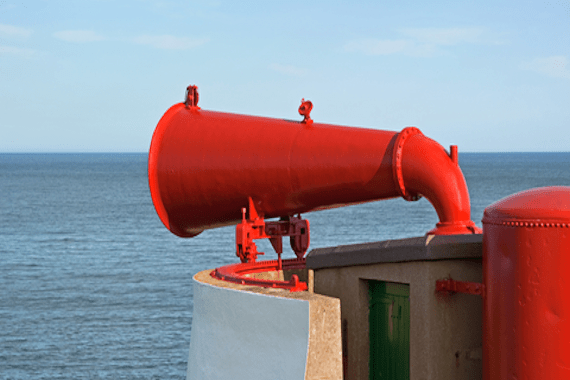 I’ve put the picture of the foghorn at the Bay of Nigg in Torry as I spotted it and it has fond memories for me of my youth, cycling, adventure and good friends. I’ve heard it’s being sold, that’s a shame. It does make this a slightly controversial post for me. I like writing the poems and I like that people ask me for them, but I still find myself blushing with shame if I launch into a Doric sentence out and about. That ingrained indoctrination as a child has stayed with my brain. Here are a few classics. Would you know them all? “Fit like?” – how are you? “Far ye gaun?” – where are you going? “It’s a sair fecht for a half loaf.” – hard to make the money cover everything. “Like a skint rubbit.” – someone far too skinny. “Ony mair o yer lip an ah’ll skelp yer backside.” – any more cheek and you’ll get a smacked rear end. “Ye mak a better door than a windae.” – I can’t see past you. “Ken fit a mean.” – do you know what I mean? “Gie it a birl.” – give it a try, or a whirl. “A bosie.” – a cuddle. “Clype.” – tell-tale, usually kids telling on other kids. Kids can have reputations damaged with each other by being accused of one small word. I say embrace it I love a bit if dialect ! I have never understood where “giving” somebody into trouble comes from. Haud yer wissht – can’t wait to say that to Gemma! Love your translations, so “proper” – any more cheek and you’ll get a smacked rear end. Had that said to me many a time as a child. Some are easy but some are not so simple. I think I’ll have to add some more sometime soon.